It depends on your answers to these five questions. For many women, the prospect of working with a personal trainer is pretty attractive: customized programming, expert coaching, zero guesswork, and cheers through every rep and set. But the truth is that not everyone has the time or money to spend on working with a coach one-on-one. Fortunately, more trainers are now offering their services through Skype, email, and online training!—with a bunch of other trainers hosting online group fitness challenges through closed Facebook groups. Chances are, you’re following at least one online trainer on Instagram right now. 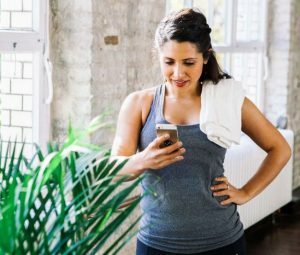 But should you double tap to get fit? Short answer: It depends. After all, as a personal trainer, I work with some women in-person and others online. I even train some through a mix of the two, coaching them in the gym once or twice a week while also giving them customized online programs that they can follow at home in between gym sessions. Every woman has different wants and needs, and a unique workout personality—so what works for one woman might not for the next. To figure out the right fit for you, and if you should take the virtual plunge, consider these five simple questions. 1. What do you want to pay? The cost of participating in an online group fitness challenge typically ranges from anywhere from free to $100 per month. 2. How much instruction do you need? “From a technique aspect, online training is definitely better for people who already have some exposure to exercise and form,” he says. “If someone is relatively new to training, I will tell them to go to the gym with a friend and to have that person take videos of them performing each prescribed exercise from different angles.” This helps the trainer identify any trouble spots and figure out what coaching modifications need to be made due to poor ankle mobility, wobbly knees, or other issues. That said, some women have enough exercise experience to feel confident exercising on their own, and honestly don’t want a trainer watching every workout. For those women, spending money on exercise cueing they don’t need is unnecessary. 3. What trainers are available in your area? This tends to hold the most true for women living in small towns with a limited number of gym-affiliated or independent personal trainers. Consider if you need pre- or post-partum training, have any other health conditions or past body image issues your trainer will need to fully understand and take into account, or if you’re just really jazzed about working with someone whose work you have followed for years. Some people need the accountability and encouragement that comes with meeting with a trainer in person three times per week, Davis says. Others would rather revel in their time alone in the gym, and get all of the motivation they need from weekly check-ins with an online trainer. Still others want to get their motivation not just from their trainer, but also from other likeminded women who are going through similar fitness journeys—which is where online group challenges really shine. Your needs and preferences are crucial when deciding how to train. After all, if you don’t complete your workouts, it doesn’t matter how expertly crafted they are. “You know yourself best,” Davis says. She recommends being honest with yourself about what has and hasn’t worked for you in the past. 5. How packed is your day-to-day schedule? Online trainers can create workouts designed to perform at home, in the gym, or even outside. That way, you can perform them whenever, wherever, and aren’t locked into working out according to your trainer’s or gym’s schedule. “This flexibility is great for busy moms and students or anyone who has an unpredictable schedule,” Davis says. After all, many personal trainers charge clients for last-minute cancellations. If you decide to opt for some form of online training, the first thing to look for is a trainer’s qualifications. Look for certifications from large reputable organizations such as the National Strength and Conditioning Association, American Council on Exercise, National Strength and Conditioning Association, National Academy of Sports Medicine or the Athletics and Fitness Association of America. If you can’t find a trainer’s credentials online, don’t be afraid to ask for them. “Any professional that has studied their butts off for certifications will be happy to send a screenshot of every single one of them,” Davis says. All qualifications aside, ask questions such as, “How accessible will you be throughout the program?” “How will you customize my routine to fit my needs?’” and “How many clients do you have?” “These are important questions to ensure you aren’t just another person with a cookie-cutter program that is blasted out to the masses,” Suter says. To start your search, consider asking for referrals from your friends, family members, or even your doctor. Check into any trainers whose blogs, articles, or workouts you already enjoy and have found useful. You can also run searches through nsca.com and acefitness.org, and verify certifications through nasm.org.